At the end of the spring semester, Athens, Georgia, thirsts for one last moment of revelry before May’s great exodus. The annual Twilight Criterium, a series of bike races paired with lax open container laws, is the city’s springtime reprieve. Now in its 36th year, Twilight (May 6-7) has expanded to include affiliated events, both athletic and alcoholic, like the Twilight Twiathalon and My Athens’ Apps and Taps Invitational. In between events and on the sidelines, Twilight is about libations, a bacchanal celebrating the approach of a quiet summer. Athens is infamous for its high concentration of bars (80 within a square mile to be exact), but standing out in a college town requires more than bargain shots and the ability to draw a crowd. Whether you’re on the sidelines or a mile away from the mayhem, the following bars and their affiliates boast quality in a bar scene characterized by quantity. Downtown Athens has either college bars or hipster bars. Manhattan (337 North Hull Street) transcends. Despite only existing for 21 years, Manhattan feels like it’s been around forever. The eclectic dive draws patrons of all ages, mainly for its neighborhood feel in an area that doesn’t feel like a neighborhood and selection of affordable cocktails. Here, you can start a dance party in the corner or gather around a bag of popcorn for an intellectual conversation without worrying about doing too much—or too little. A hop away from Manhattan is The World Famous (351 N Hull St), the vibrant brainchild of Bain Mattox. Beloved for its technicolor cocktails and street-style dishes like steamed pork buns and chicken and waffle club sandwiches, this spot packs some of Athens’ top cultural highlights into a snug space. Local art just as colorful as the drinks adorns the walls and massive countertop, while regional musicians frequently grace the Famo’s small stage. They’ve also got a nice PBR special for those who want to save some dollars. Unless you’re hitting up a brewery, Trappeze Pub (269 N Hull St #6) is where you go for a glass of craft beer. End of story. Trappeze boasts the largest selection of beer in downtown Athens, with 33 constantly-changing taps flowing with brews from as close as a block away to the reaches of Western Europe. Cocktails are available via their adjacent operation, Highwire Lounge. Round out that beer belly with a hearty sandwich or snacks like lightly spiced, non-vinegary boiled peanuts and floppy french fries slathered in garlic aioli. A 20-minute walk away from the revelries of downtown, Athens’ Normaltown neighborhood is carving its own bar scene along its stretch of Prince Ave. Nothing exemplifies this westward wave better than The Old Pal (1320 Prince Ave, pictured at top). Opened in 2013, the neighborhood bar is both a go-to for specialty cocktails and the kind of place you can go on a weeknight and carry on a meaningful conversation with your bartender. It’s crepuscular but not too dim, with forest green walls and tealight candles dotting each glossy, chestnut-colored tabletop, and their wine selection rivals that of a nice restaurant. 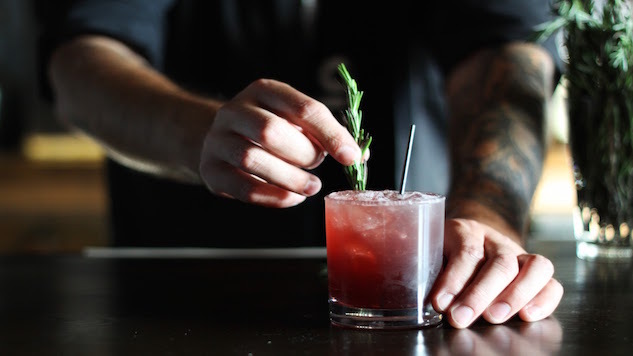 House-made staples like bitters, tonic, citron syrup and strawberry shrub amplify an Old Pal cocktail’s quality. A few doors down from The Old Pal sits the Hi-Lo Lounge, (1354 Prince Ave) the latest bar to join Prince Ave. There isn’t really a determined atmosphere or theme, as the vibe here is a hodgepodge of normalcy – board games, a shelf dedicated to hot sauce, and empty beer cans utilized for decor are juxtaposed with large brown sofas and framed vintage maps. Hi-Lo is all about enjoying a few beers with your friends at any time of the day rather than the 11:00 rush that popularizes downtown. It’s also a great spot for junk food, namely Cincinnati-style chili, fries and some of the best hot dogs in town along with reputable vegetarian and vegan fare. Hi-Lo isn’t trying to be anything or impress anybody, and that’s precisely what makes it special. Sarra Sedghi is Paste Travel’s News Editor.